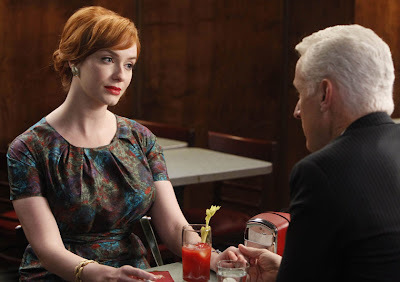 Off The Presses: Mad Men and Drinking, Season Four, Episode 10: Don Needs a Drink! Mad Men and Drinking, Season Four, Episode 10: Don Needs a Drink! And he deserves one! When Draper learned that the Feds were looking into his background after SCDP client North American Aviation requested a security check, he reached right for the Canadian Club, and threw a belt back, despite having backed off the juice all summer 1965. He then had a panic attack, threw up, confessed his past to new squeeze Faye, and leaned on Pete Campbell, of all people, to make it right. When Roger finally has the guts to tell the partners at the firm that Lucky is gone, they'll all need a stiff drink.